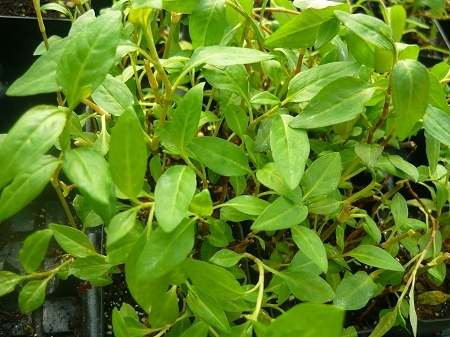 Vietnamese Coriander (polygonum odoratum) Also called Rau Ram this interesting herb plant has an excellent coriander/cilantro flavor. Unlike regular cilantro, Vietnamese Coriander enjoys hot and humid weather and can easily be grown all summer long. Low growing vining-like plant is at home in containers, hanging baskets, or in the herb garden. Does require adequate water. Warm climate perennial zones 11+ can be grown indoors with good light. Live plant in 3 inch container. Polygonum Odoratum (Rau Ram) is a favorite at our table. We enjoy it mostly in Thai and Vietnamese recipes, and use it both raw and cooked. Anywhere cilantro/coriander leaf is called for, it can be used, as the taste is similar, with a citrus and camphor/mint undertone - bright and lovely. It doesn't overwinter here in southwest Ohio, but I usually grow it in a pot just outside my kitchen door, so it is very easy to bring it indoors when the weather turns cold. Colonial Creek Farm provided the strongest, healthiest plants I've ever received when purchasing this herb (and I've bought quite a few plants online over the years.) It loves hot temps, and I grow it in indirect sun, as I find it burns in full sun. A bushy, slightly creeping, leafy plant with pretty dark purple markings.